Whoops what happened to November? I didn’t get a chance to post all the lovely photos I have received last month so am doing December’s photo shoot early. 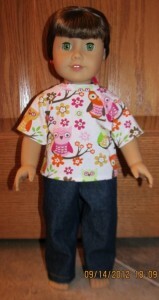 First up are photos from Andrea who is doing my How to Make Doll Clothes Course and sent me photos of the first four bonus patterns. She has made the Crop Top & Sports Shorts and the Halter Top & Sarong for her 14 inch Waldorf doll who looks so happy to have new clothes. I am looking forward to seeing what you make next Andrea. 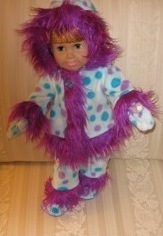 Peggy has been very busy making Funky Fur outfits as Christmas gifts for her Granddaughters and friends. I had a huge laugh when Peggy wrote, ‘I can actually talk now that I have cleared all that fur fluff out of my mouth, ha,ha.’ I know what she means but it is so worth it as they all look awesome! Peggy did suggest something that made cutting the fur less ‘messy’ and that was to use a tiny pair of embroidery scissors with really pointy tips. 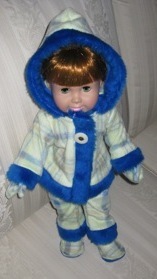 It got under the pile of the fur quite easily where her regular scissors were too bulky. With the tiny ones she had no trouble at all. 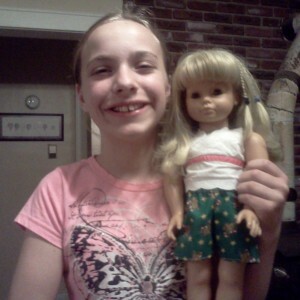 I love that she is so excited to be learning to sew. 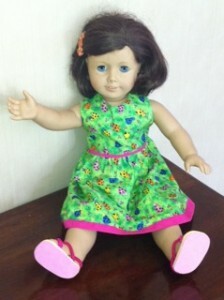 Pilar has sent in photos of the dress she made from my Summer Dress pattern, I absolutely love the colors and I’m pretty sure her doll, Maria, does too. 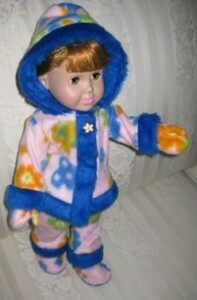 She has also made a cute pair of Winter Pyjamas so she is all ready for those cold nights ahead. Pilar also wrote…. 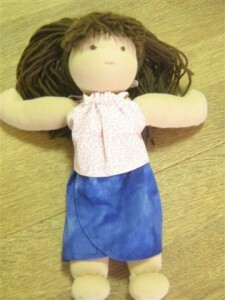 Crystal must be addicted to sewing doll clothes because she has made so many outfits since becoming a member of Rosie’s Doll Clothes Patterns. 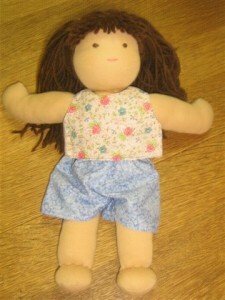 She must have every one of my patterns and is a regular in my Happy Customer photo blog. Her husband thinks she should sell them because she does such a wonderful job and I totally agree! 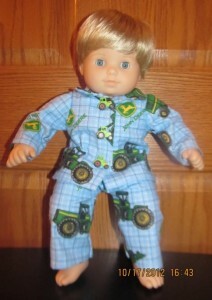 Crystal has included this picture of the flannel pyjamas she adjusted for Bitty Baby. All that needed to be done was shorten the bottoms about 1 1/2″ to make it fit him. 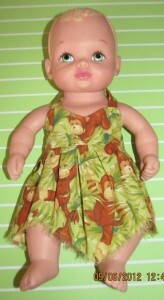 It is great to know that this 18 inch pattern also fits the Bitty Baby and I would love to know if you find any of the other patterns I have fit the Bitty Baby as well. And finally in this photo shoot is Crystal’s Sewing Machine Pin Cushion. 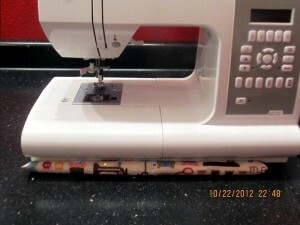 She had to adjust the size a little to fit under her machine and used a lovely sewing print, it looks perfect. I will have some more of Crystal’s photos in my next Happy Customer blog. Wow! There have been lots of busy people sewing doll clothes and I’m sure some of them will be wonderful presents to be given at Christmas time. Thanks so much to everyone who has sent their photos in, I know everybody else loves to see what you have made. 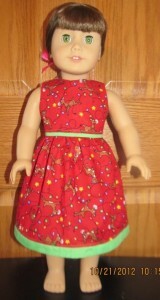 Don’t forget the special Christmas offer of an additional bonus pattern with my How to Make Doll Clothes course. The value of this offer is simply amazing! 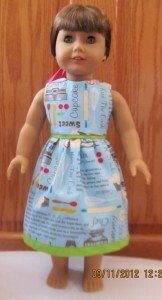 You get my How to Make Doll Clothes course with over 130 video tutorials showing you all the tips and tricks that will take away your fear of sewing doll clothes. PLUS you also receive 9 Bonus doll clothes patterns with step-by-step video tutorials so you can start making doll clothes straight away. That’s a total value of up to $107.49 ($127.49 DVD set) for only $49.94 ($69.94 DVD set). This offer is only available until midnight on Christmas Eve ‘sew’ what are you waiting for? To buy my course and receive this special Christmas bonus, click here. Great photos and lots of ideas…lovely work everyone. I’ll certainly take Peggy’s scissors tip on board…those outfits are gorgeous.. Even though we are in the middle of summer ‘a girl has to be prepared’ for any fashion emergency. best wishes and Merry Christmas to all. It may be summer where you live, but we live on the east coast of Canada, and believe me when I say it is pretty darn cold in most of Canada right now. Several areas are buried in snow. It has been so cold lately that my husband and I had to leave and head to the southern USA (Florida) for a few weeks to thaw out. We’ll go back home for the holidays, but return to paradise for our winter months. This course has helped to add a new dimension to my relationship with Amy (pictured above). 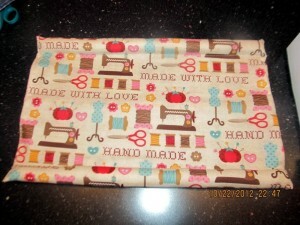 We now share a love of sewing! Thanks so much Rosie for helping me teach her.